There are lots of things I like about Raekwon the Chef, whose gig at Matter in London I saw last night (a review for The Guardian will be linked to here when it's published later in the week). I like that his new album, Only Built 4 Cuban Linx Pt II, tries to progress his music forward by taking its methodology back to the earliest records he made. I don't have any truck with the idea I've heard advanced that he's being retrogressive by re-immersing himself in a lyrical life of crime the real-life rap star left behind years ago: he's writing fiction - vivid and truth-inspired though it doubtless is - and we don't hold authors, novelists or screenwriters to such merciless account. (And besides which, in songs like Canal Street, Rae not only explores that duality, he makes it his home.) It's the best, freshest-sounding, most intricate and detailled and exciting hip hop record I've heard in ages. I also like that, on stage, Raekwon acts like he's making it all up as he goes along, just as we're supposed to think he does in his songs. I say "acts like" - but he almost certainly is. I also like that what you see on stage is also almost certainly what you'd get if you sat down to speak to him. I've interviewed him twice - most recently for this piece - and the between-song storyteller on stage at Matter last night felt like the same person who prefers rambling conversation to the ritualised formality of the question-and-answer session, who thinks about what he says as he's saying it, who never reverts to media-trained, knocking-out-the-next-interview script. I like how he knows that he needs his fellow Wu-Tang Clan band mates, yet doesn't need them at all; the way, on record, he's generous to a fault, allowing Ghostface (always) and Inspectah Deck (a revivified, energised presence on OB4CL2) to take pole position, and how on stage he'll rap their lines, in something approximating their voices, as if they were his own. I really like that he's a chubby bloke, and makes fun of that. That gives the rest of us chubby blokes a bit of heart. But most of all I like that at any one time you can see all of these attributes at once. 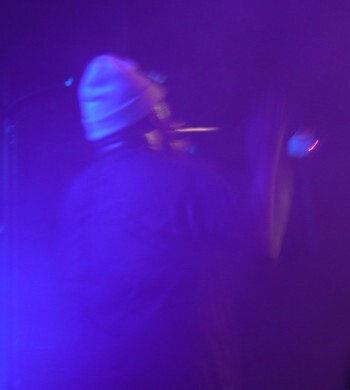 You might miss the poise and precision of a more polished performer when you see a Raekwon show, but you're only seeing a facade from the others. Rae puts it all out there, all at once: the spasmodically dazzling genius, the drunken oaf, the dry witticisms and the gauche misfires, the musician with the filmmaker's eye for detail and the 20 years experience, and the random bloke in a t-shirt and woolly hat who seems to have found himself in front of a crowd after taking a wrong turning on the way back from the toilet. And I also like that I don't ever get the sense that this lack of artifice is deliberate. Raekwon just can't help being honest about who he is, what he does and how he thinks, and that makes his music and his performances all the more compelling. 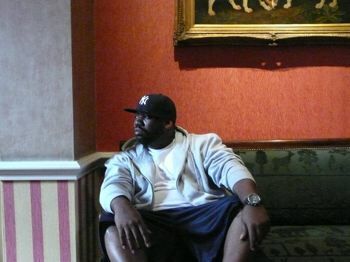 Raekwon, London, July 22 2009 - the day after he finished OB4CL2.